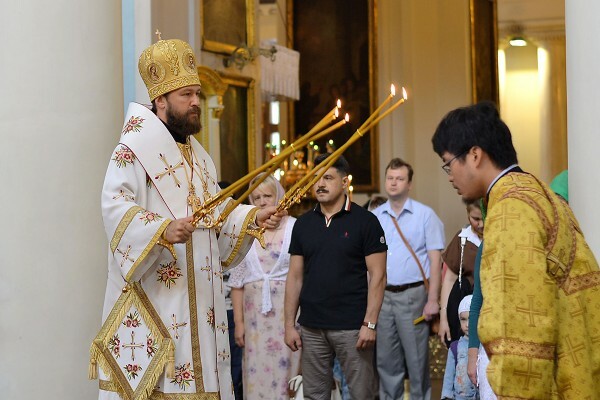 On July 24, 2014, Metropolitan Hilarion of Volokolamsk, head of the Moscow Patriarchate’s department for external church relations, celebrated the Divine Liturgy at the church of Our Lady the Joy to All the Afflicted-at-Bolshaya-Ordynka in Moscow. He was assisted by representatives of Local Orthodox Churches of Antioch, Jerusalem, Bulgaria, Czech Lands and Slovakia, and America, as well as an assembly of Russian Orthodox clergy from Russian Orthodox dioceses in Russia and other countries. After the liturgy, Metropolitan Niphon of Philippopolis extended congratulations to Metropolitan Hilarion on his birthday on behalf of the representatives of Local Orthodox Churches to the Moscow Patriarchate. He noted the role that Metropolitan Hilarion in his capacity of the DECR chairman played in strengthening relations between Orthodox Churches, saying, “You glorify the Lord both as personality and head of the DECR”. Archimandrite Philaret (Bulekov) addressed His Eminence Hilarion on behalf of the DECR staff, saying in particular, “We thank God for another year of your life because we have lived it together with you, sharing your work every day and helping you to bear the enormous responsibility placed on you by His Holiness Patriarch and the whole Russian Church… By your experience you make up for our shortcomings and lack of knowledge, and we accumulate the experience which will certainly be placed in the basis of our future efforts in the name of the Church of Christ”. Addressing the congregation, Metropolitan Hilarion thanked all for the warm congratulations on his birthday. Then he spoke about the divine will that ordains one to be born at a particular place at a particular time and the human will that one develops through one’s life. Eventually, he said, “the ultimate result of one’s life is a fruit of not only God’s will but also man’s will. As we know from the works of Holy Fathers, the two wills, Divine and human, should be in perfect harmony, that is, the human will should obey the divine will so that one’s life may develop the way the Lord wants”. Noting that his birthday falls on the commemoration day of St. Olga-Equal-to-the-Apostles, Metropolitan Hilarion cited her as an example of obedience to the call of God. “She acted in defiance of what today can be called “mainstream” since all those around her were heathens… Her example shows that an apostolic feat can be performed even in a situation of constraint promising no success. The Church glorifies her because she did the will of God acting against the spirit of time. When Rus’ was heathen she clearly saw the Christian future of our country and people… On this day, let us pray to St. Olga that she may help us not only hear God’s call but also follow it in our life journey”, he concluded.